The United States threatened Monday to arrest and sanction judges and other officials of the International Criminal Court if it moves to charge any American who served in Afghanistan with war crimes. White House National Security Advisor John Bolton called the Hague-based rights body "unaccountable" and "outright dangerous" to the United States, Israel and other allies, and said any probe of US service members would be "an utterly unfounded, unjustifiable investigation." "If the court comes after us, Israel or other US allies, we will not sit quietly," Bolton said. He said the US was prepared to slap financial sanctions and criminal charges on officials of the court if they proceed against any Americans. "We will ban its judges and prosecutors from entering the United States. We will sanction their funds in the US financial system, and we will prosecute them in the US criminal system," he said. "We will do the same for any company or state that assists an ICC investigation of Americans," he said. Bolton made the comments in a speech in Washington to the Federalist Society, a powerful association of legal conservatives. Bolton pointed to an ICC prosecutor's request in November 2017 to open an investigation into alleged war crimes committed by the US military and intelligence officials in Afghanistan, especially over the abuse of detainees. Neither Afghanistan nor any other government party to the ICC's Rome Statute has requested an investigation, Bolton said. He said the ICC could formally open the investigation "any day now." He also cited a recent move by Palestinian leaders to have Israeli officials prosecuted at the ICC for human rights violations. "The United States will use any means necessary to protect our citizens and those of our allies from unjust prosecution by this illegitimate court," Bolton said. "We will not cooperate with the ICC. We will provide no assistance to the ICC. We certainly will not join the ICC. We will let the ICC die on its own." The condemnation of the ICC added to the White House's rejection of many supranational institutions and treaties the president does not believe benefit the United States. Bolton also condemned the record of the court since it formally started up in 2002, and argued that most major nations had not joined. He said it had attained just eight convictions despite spending more than $1.5 billion, and said that had not stemmed atrocities around the world. "In fact, despite ongoing ICC investigations, atrocities continue to occur in the Democratic Republic of the Congo, Sudan, Libya, Syria, and many other nations." he added. 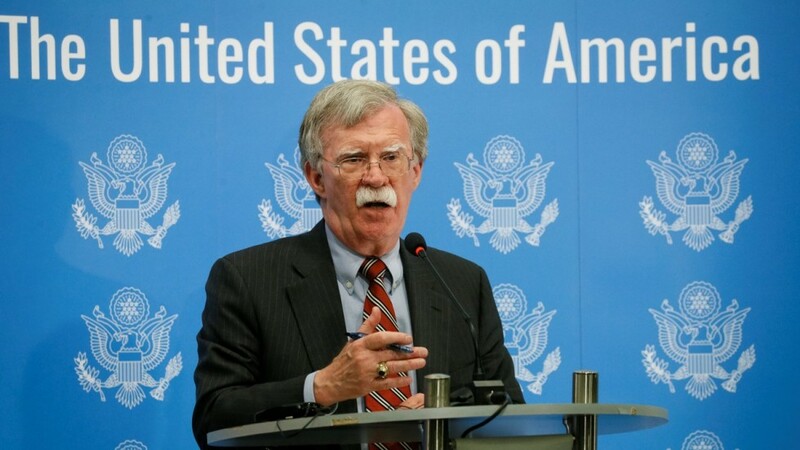 But Bolton said the main objection of the administration of President Donald Trump is to the idea that the ICC could have higher authority than the US Constitution and US sovereignty. "In secular terms we don't recognize any higher authority than the US constitution," he said. "This president will not allow American citizens to be prosecuted by foreign bureaucrats, and he will not allow other nations to dictate our means of self defense."